NICK MATTHEW has joined the debate that has sprung up over a sudden “get-tough” refereeing policy at the Commonwealth Games. Officials have clearly been instructed to clamp down on lets, but the result has led to a chorus of confusion among players, coaches, fans and commentators. One case that has led to considerable debate arose when Welsh number one Joel Makin was denied a let on match ball down against Paul Coll in today’s semi-finals. The decision mystified many onlookers with Coll’s soft forehand landing in the service box. As Makin attempted to move from the T to the ball, he found Coll in his way. The position of the ball, and Coll’s position on the court, would normally have led to a simple “Yes, let” decision. There was no deliberate blocking – Coll is not that type of player – and Makin felt hard done by (understatement of the year) as his valiant bid for a place in the final was denied by what many felt was a dodgy decision. There are, as always, several ways to look at this issue. Of course we want fewer soft lets, especially when the sport is under the microscope and bidding for a deserved place in the Olympic Games. Large parts of the world are tuning in to the Commonwealth Games and, as the biggest event to showcase our Olympic credentials, it is of paramount importance that the sport is displayed in all its gladiatorial grandeur to show the IOC what they are missing. However, with the frequent stoppages and debates caused by many of the decisions, it may well have had the opposite effect. Bear with me while I take a little trip down memory lane. In the great heyday of squash, when the game boasted close to three million players in the UK, London had two major rivals, Lambs and Cannons Club, competing in the American Express Premier League, the forerunner of today’s PSL. Lambs owner Mike Corby, a former England international and one-time president of the former SRA, always delivered the same pep talk to his star players. Not any more, it’s not! When young players are taught the basics, the need for good length and tight drops are among the first things they learn. However, what we have seen in the Gold Coast this week has, on many occasions, been exactly the opposite. Play a loose drive, with the ball bouncing in the service box, fail to move off the ball, thereby blocking your opponent’s path to the ball, and the referee will give you the point by saying “No Let” to your opponent. 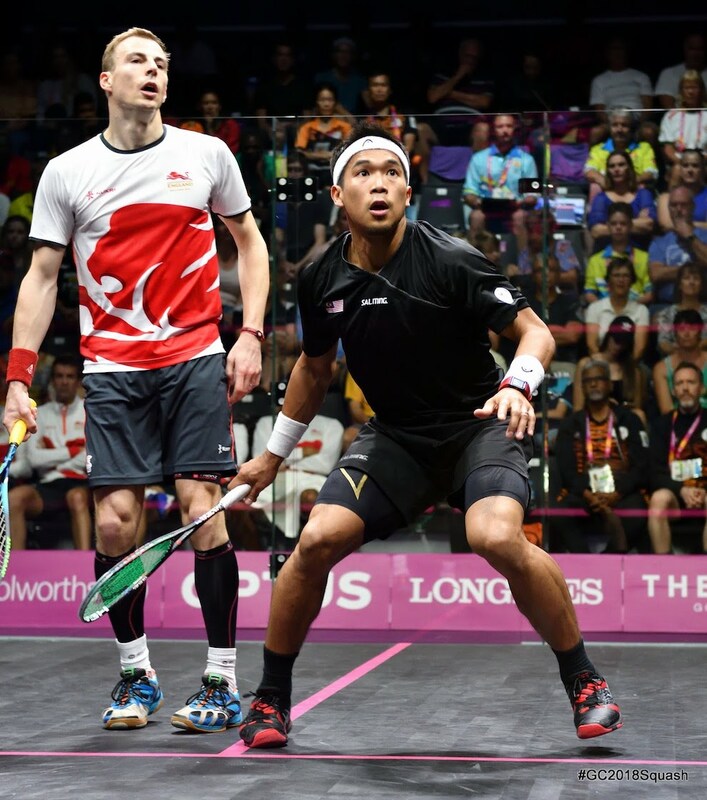 Play a loose drop shot that lands four or five feet from the front corner, impede your opponent’s path to the ball, and once again you are likely to win the point in similar fashion. It goes against everything we thought we knew about the game. No wonder Nick Matthew and several fellow professionals admitted to being confused. Perhaps these following questions need to be answered. Where was this decided? And by whom? Who thought this was a good idea? Why was it not discussed with the players in advance? 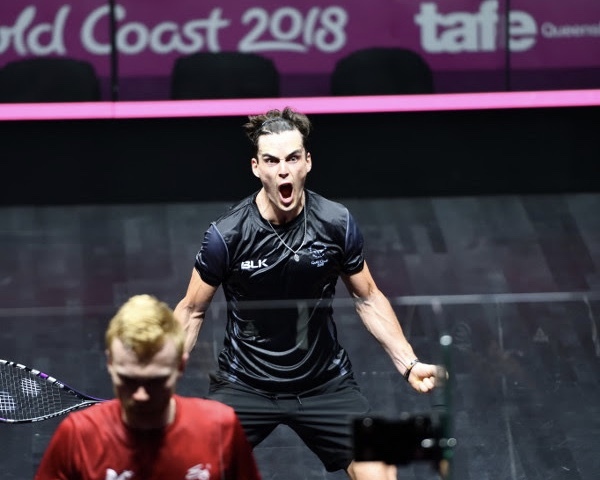 The crowds in Gold Coast, as in Glasgow in 2014, have created a wonderful, carnival atmosphere which has clearly inspired the squash players to produce fabulous, breathtaking performances on court every single day. They are going the extra mile in showcasing all the dynamic attributes that the sport has to offer as occasions like this fire up the bid for Olympic inclusion. This is not about referees, rules, or committees. This is about giving our very best players the opportunity to play at the highest level, in the Olympic Games. They are the ones feeling the most pain at our continued exclusion. Nicol David, as we all know, spoke for the whole sport when she stated that she would happily trade in her eight world titles for a single Olympic gold medal. For the players to be treated like this seems a bit shabby. Matthew Pinsent talked to James Willstrop for the BBC after his semi-final win and then announced on Twitter that the highlights would be shown on BBC2. Pity the whole brilliant match wasn’t shown live. After watching hours and hours of gymnastics the previous night, the “live” show hosted by Clare Balding squeezed an amazing day of squash drama into a three-minute round-up. Official verdict on proceedings from Andrew Shelley, the CEO of the WSF: “Squash was one of the real sports-successes in Glasgow. The presentation, broadcast, spectator levels, atmosphere and the matches themselves were superb…….. and Gold Coast is matching that. “Great crowds from day one have turned into full houses from singles quarter finals onwards; and they have been treated to an array of matches of the highest standard, with sheer athleticism, upsets, comebacks and tight finishes bringing the audience first to the edge of their seats then up off them! After competing in the final, and then the doubles, and then gearing up for the British Open, James Willstrop is ready to swap the wooden floor of the glass court in the Gold Coast to tread the boards on stage in Harrogate. The Times wrote: “James is not accustomed to the limelight. He is the greatest English athlete you’ve never heard of; a one-time world No 1, he has medals from every tournament in his sport, including three world titles. Today he will play in the semi-finals of his fourth and, he says, final Commonwealth Games. Being here at the Commonwealth Games and having watched a lot of matches while I have been here I have been astounded and alarmed by the poor standard of refereeing. Not only have they changed the thinking over let’s/ no let’s but have encouraged blocking. On top of this the Video reviews have taken too long for a simple let decision as if the Video ref is looking to award anything but and there have been many bizarre video decisions. Further I have been unhappy with the attitude of many refs towards the players. It has been arrogant and confrontational in several cases eg Alan Clyne stopped when he might have hit Joel Makin in the backswing, simple safety let as he didn’t know where he was and there had been no fishing previously. Clyne protested and was immediately given a “ conduct stroke ” for time wasting. It was unnecessary and left a sour taste in what was a fair game. Having watched a lot of squash over the years I do feel the poor standard of refereeing at top level is one of the main reasons the sport has not become an Olympic sport. Any Olympic observer who had been at the Windy City Open recently and then watched here would have seen a different set of rules applied. Confusing to observers, spectators and players. PSA and WSF should have addressed this glaring weakness in the game some time ago. I fully accept that players have increasingly been “looking” for strokes so it’s a good thing if refs encourage them to play the ball. However the application of this by refs at the CWG has been woeful. Players have been refused lets when they simply can’t get to the ball because their opponent is in the way. This is going to lead to the game becoming very physical with players having to barge each other out of the way in order to be granted a let. Also, refusing even a let because the ref decides the player was “looking” for a stroke is misguided. By all means just award a let if they could have played the ball but don’t refuse them even that. That is referee interference! Further, awarding a penalty stroke against players for dissent is interference. If the ref was always right (!) I might have some sympathy, but they have been so often wrong, the players are fully justified in challenging a lot of their decisions. Finally, we need consistency in refereeing throughout the tournament calendar so players know what to expect. To introduce the approach taken by refs at the CWG without prior player consultation is outrageous. Good to see a ref with a backbone awarding a conduct stroke for dissent! Nothing more embarrassing for the sport than allowing players to argue without consequence, particularly when they open the door. There might be benefits to squash as a spectacle if there was a tougher line on not making a good effort to clear and a good effort to find a line to the ball, but of course there’s no way to remove the problem of how to draw the line fairly, especially with those players who are good actors. Agreed that if the refereeing philosophy has shifted significantly, then they should have clearly signalled that. I have a different view on the Makin no let – I thought it was a marginal let, not a clear let. It was clear from earlier decisions that a strict line was being taken, i.e. if there’s an acceptable route to play the ball, you need to take it. It was actually an unusual shot from Coll, soft and dipping to bounce in the service box. If Makin had been closer to the box or moving in earlier, the volley may have been on, but he was actually coming in from quite a wide position. So if there wasn’t a clear volleying opportunity, there was never going to be a stroke, and enough to put it in the referees’ mind that the player should have been avoiding contact, and taking a line further back, to take the ball after the bounce. As there was an element of doubt, and given that Makin had no obvious benefit from asking, a let would have been a reasonable decision, but I can see why a no let would be consistent with the earlier decisions. A pity for it to end like that, but Makin would have been better not risking it on match ball. Sounds like a lot of whining. And ludicrous to suggest that referees make a pre-match announcement. That said, the old PST no-let rule–where there are no lets awarded period, and which seemed somewhat laughable–isn’t looking so bad now. Why ludicrous? Should be about the players not the ref. Ted, I think you have missed the point. Grab a coffee and have another read. No-one suggested referees making pre-match announcements. Nick Matthew felt that any decision to interpret the rules differently should have been communicated to the players, presumably via their national federations, in advance of the tournament. This is not PSA. The PSA have been involved in ongoing dialogue with referees for three years. Most players genuinely make every effort to play the ball at all times. As Hedley Matthew said in his comment, several players have been denied a simple let when stopping for safety reasons. As Mike Hughes points out, issuing No Lets when interference is obvious, can only lead to more physical play. Policy Decision by Refs Committee is totally ruining squash on the biggest ever stage, in front of the World and more importantly the IOC..Some cringingly incredibly bad decisions which literally wreck players lives.A lousy advert for Squash, not helped by frequent court cleaning stoppages and Perrys behaviour which cost her dearly. The PSA should insist only top ex players are involved at the highest level. Squash needs to sort its act out, the rules (if you read them) are clear and you don’t interpret them, you apply them. NO other sport has this bullcrap where you tune in to see the players, referees and commentators not being clear on the rules of the game, a shambles!! Reffing is a thankless job. Refs never get praised, they only get teed off on from the cheap seats. Do you think any former top players would let you put them through that? I think Mark Bellinger has hit the nail on the head when he says it is the referee’s job to apply the rules not interpret them following someone else’s guidelines. As Alan has stated the access rules are clear and yet I hear refs saying “ you need to go round him/her ” when the direct line is through the opponent also I hear “ there is a line behind him/ her ” when the player can volley the ball. I don’t think that’s a good comment for Nick !! Peter Barker suggested a group of professional referees for World Series events some years back with promotion / relegation into that top sphere. This was not taken up because the players would lose prize money if refs were paid adequately, promoters would have to look for extra sponsorship, the PSA and WSF were not willing to take action and the current crop of refs would probably be demoted quickly. But action is needed as the players are unhappy and despite what Ted Gross feels the game is for the players – no one comes to watch the referees. In my honest opinion, Squash is a sport that is played by professionals but run by amateurs. The referees should be well paid professionals, not a volunteer army. Playing devils advocate, there is a certain enjoyable drama about the altercations between player and referee, add the video review into the mix and this really does add to the whole theatre, however, in the final analysis we have to see that the rules of the game have been properly applied, that justice has been done and that it is the victorious gladiator taking a bow at the end…not the referee! First of all Peter Barker is retired now, so let him stop talking about it and get certified and become a referee. Second, the PSA and WSF need to fine and/or sanction players who speak out publicly against the referees. Third. Every pro tournament has strange calls now, if you’re measuring the application against the letter of the rule, because the underlying approach is to avoid replaying points. Agreed, it’s not about the refs, but it’s not about the players either – it’s about the viewers. Well Ted , I find your views fascinating! 1. A Squash great such as Peter Barker is not allowed a view on the game ? 2. Players are not allowed to comment on the game from which they earn a living and who the crowds come to watch . This is purely the prerogative of the governing body and the referees ? 3. The game has nothing to do with the players but only to do with the spectators . ? (1) What a distorted reading – no-one is excluding anyone’s views. Ted simply said that, if Peter Barker is advocating professional referees, why doesn’t he (or any ex-pro) give it a try, now that they’re not touring? Perfectly reasonable comment. (2) Pros have various channels, formal and informal, to communicate with the refs. They don’t need to wash their dirty linen in public. Perfectly reasonable comment, and “saves face” of those doing a thankless task. Very much enjoyed watching the CG squash and impressed with the huge crowds. Not impressed with some of the players’ attitudes, especially by Daryl Selby on the last point of the match. I play a lot of club squash and ref often. You should not be allowed to make any suggestion of a referee’s integrity at any level and get away with it. I hope England Squash take action against him for his unsporting conduct. They won’t take any action, and neither will the WSF, because they’re intimidated by the players. It will continue that way as long as players like Nick Matthew are allowed to Tweet negatively about referees with no consequence. By contrast, an NBA player recently suggested the league should get a new crop of referees, and he was fined $25,000 for public criticism of officiating.